We wanted to share some sad news. Juneau, one of TRC’s winged ambassador peregrines, was humanely euthanized recently. She had begun to display some neurological signs, and very quickly her condition declined. Her condition was complicated by pathological changes in her cardiovascular system, which were noticed during her diagnostic work-up. *She was in 273 programs in 2014. *We estimate that she was in a whopping total of more than 3875 programs for 116,340 people in her time here at TRC! *She visited classrooms and events all over Minnesota, Wisconsin, Iowa, Nebraska, and North Dakota and as far away as Florida. It is clear that her impact is not numbers alone. She was a living embodiment of efforts to save a species. 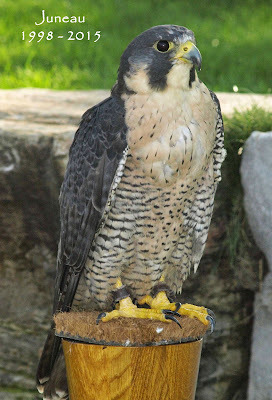 She was part of a larger story of The Raptor Center’s (with many partners) successful efforts to restore the peregrine falcon in the Midwestern United States. Juneau was instrumental in telling the story of the Endangered Species Act, banning DDT, and of people working together to ensure a future with intact and healthy ecosystems. Her legacy is in the children that have seen her --- a real live peregrine falcon. Not in pictures, in books or on video, but living right in front of them. You could see it in their eyes. In that moment the children understood how incredible it is that these animals exist. These children are the future that will ensure peregrines continue to fly free. They are the legacy of The Raptor Center’s mission: To ensure the health of raptors and the world we share through teaching, research and service. Juneau, you will be missed, but your impact will not be forgotten.